In the wreck of the Costa Concordia, the cruise ship that rent its hull against the offshore shallows of the Italian island of Giglio, the world was treated to an exhibition of both the best and the worst of the Italian approach to disaster. On one side stands the ship's captain, Francesco Schettino, who seems to have thrown procedure to the wind when he reportedly diverted the 1,500-cabin luxury liner from the deep water route usually traveled by ships of its size and pulled the vessel to within 150 m from shore. Prosecutors allege that Schettino chose the maneuver to provide inhabitants of the island with a multi-story spectacle of deck lights, a show-off stunt enhanced by a blast of the ship's sirens. At least eleven people were killed when the nearly 310-m long vessel capsized dramatically not far from shore less than an hour later. Another 28 of the more than 4,200 people on board remain missing. Schettino has been arrested on charges of manslaughter and abandoning his ship; he has blamed errors in his navigational charts for the accident. On Sunday, the company that owns the ship, Costa Cruises, said in a statement that "preliminary indications" were that "significant human error" lay behind the crash. "The route of the vessel appears to have been too close to the shore, and the captain's judgment in handling the emergency appears to have not followed standard Costa procedures," the statement read. 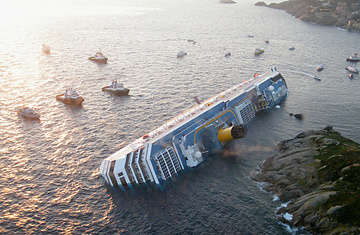 Schettino has denied he abandoned his ship, insisting he was among the last to leave. Such careless concern for the rules of safety is tragically common in Italy, albeit usually on much smaller scales. "There is a permissive interpretation of the rules concerning safety," says Gianfranco Pasquino, professor of political science at the University of Bologna. "We know that some of the rules are perhaps irrational. Some cannot be implemented. And others have loopholes, here and there. And so we rely on our own sometimes flawed judgment to decide what can and should be done." Thus, construction workers climb scaffolding with their helmets hanging from their belts; nobody worries too much if a fire extinguisher or first-aid kit has gone missing; and many Italians treat seatbelts as optional, especially for small children. In a country where laws and standards stack up like overlapping archaeological sediment, it's often easier to beg leniency than to ensure compliance. "The sanctions are missing," says Pasquino. "There are few chances that you will be punished, unless a serious incident [like the crash of the Costa Concordia] takes place." As a result, says Maria Giovannone, a researcher at ANMIL, or the National Association of Workplace Accident Victims, Italy has historically had one of the highest levels of workplace accidents in the European Union. "We have a lot of formal standards," she says. "But, when it comes to the ground, they often aren't observed." She added that in the case of the cruise-ship crash, an investigation would show whether early reports by evacuees of confused and unprepared crew members reflected carelessness on the part of the cruise-ship operator. "At first glance, from what passengers have told people, it seems from the point of view of safety, the cruise-ship company hasn't made big investments in safety training and in emergency planning." Costa Cruises says it complies with "all safety regulations," adding that its crew was trained and certified, and regularly ran evacuation drills. So what is the good side to all of this? While passengers on the ship may have experienced the worst of Italian disaster response, what waited for them onshore was among its best. Citizens of the tiny island greeted the bedraggled evacuees with donated clothes and blankets. Others sailed forth on small boats to rescue passengers who had yet to arrive. And still more opened their homes to those who had nowhere to stay. "There was a lot of support from the Italians onshore," says Pasquino. "This is the way Italy works. When the rules and standards fail, we have to make up with our personal generosity." See Cartoons of the Week.